(Bloomberg) -- Apart from culture, food and a super-efficient rail system, one of the things that most impresses travelers to Japan are its convenience stores, bursting with sushi, alcohol, underwear and ready-made food available at all hours. Well, maybe not for long. The 24-hour “conbini” experience is starting to show cracks as a labor shortage in the world’s third-biggest economy forces operators to consider cutting store hours. 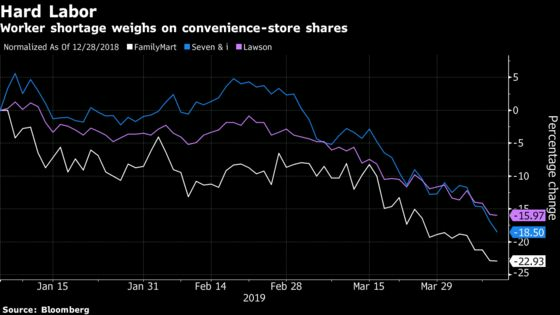 On Wednesday, FamilyMart UNY Holdings Co. joined Lawson Inc. and Seven & i Holdings Co. in saying that they are contemplating changes and testing reduced hours in order to cope. With unemployment at 2.3 percent, near 1992 lows, Japan’s labor shortage is being felt acutely across all industries, from construction demands ahead of the 2020 Tokyo Olympics to caring for a rapidly aging population. Convenience-store operators are feeling the pain. In a survey by the Ministry of Economy, Trade and Industry last year, 61 percent of convenience-store franchisers said they didn’t have enough workers, almost triple the ratio from 2014. Many store owners are required to keep their doors open all hours of the day, because it’s written into franchise contracts that can last up to 15 years. In the past, franchisers such as 7-Eleven owner 7 & i Holdings rigidly enforced store hours even as Japan’s labor crunch worsened. The operators argued that they needed to generate profits by selling to nocturnal consumers in cities and stay open for residents in rural areas. Now, that seems to be changing. FamilyMart, which has more than 16,000 stores throughout Japan, said Wednesday it will experiment with reduced-hour operations. It is offering 270 stores the option to join the project, which begins in June and will last up to six months. 7-Eleven, the largest convenience store operator in Japan, tested a non-24 hour program in 10 directly managed stores in March, and will allow franchisees to test the operating model starting this month. “We need to be flexible in thinking about dealing with the customer and the location’s needs as well as the franchiser’s,” Seven & i Holdings Chief Executive Officer Ryuichi Isaka said last week. Restaurant chains Royal Host and McDonald’s have also cut back on 24-hour operations in recent years. Retailers aren’t the only ones feeling the crunch. Last year, 153 companies in Japan went bankrupt due to labor shortages, up 44 percent from the prior year, according to Teikoku Databank Ltd.
“We recognize, as a government ministry, that this is a serious problem,” Hiroshige Seko, METI’s minister, said at a meeting with executives from eight convenience store operators on April 5. He noted the tighter labor market and burden on store owners, adding that convenience stores were a “necessary infrastructure” for the population of 126 million.